Worldwide PC shipments increased 12% year-on-year in Q4 2012 to reach 134.0 million units, with pads accounting for over a third. 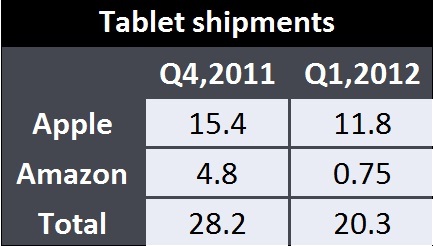 Tablet segment grew by 75% in Q4, 2012 to 46.2 million units with full year shipments totaling 114.6 million units. HP shipped 15.0 million PCs, beating Lenovo by 200,000 units to regain second place, with both vendors taking an 11% share. Samsung, buoyed by strong tablet shipments, had its first quarter in the top five, shipping 11.7 million PCs, giving it a 9% share and fourth place ahead of Dell. Samsung shipped 7.6 million pads in Q4, an increase of 226%, driven by its ability to push products down into lower price bands. Amazon’s worldwide shipments grew 18% to 4.6 million units, as it expanded the Kindle Fire range and launched in markets outside the United States. Google’s own Nexus 7 and Nexus 10 products performed relatively well, with combined shipments of 2.6 million taking 2% of the global PC market share. Lending more credence to an earlier observation that I had- Amazon will take over the publishing business – the latest reports from Amazon suggest that eBooks as a category have grown 70% Y-o-Y even while the eBook readers (devices) have plunged 36%. The key here is that even while eBook readers are on their way down, Amazon’s Kindle is doing as good as Jeff Bezos would like it to. After 5 years, eBooks is a multi-billion dollar category for us and growing fast – up approximately 70% last year. In contrast, our physical book sales experienced the lowest December growth rate in our 17 years as a book seller, up just 5%. We’re excited and very grateful to our customers for their response to Kindle and our ever expanding ecosystem and selection. The key is the eco-system and the network effects which is priming the Amazon business of books and a shifting habit from physical to electronic reading. Amazon’s kingship at electronic distribution has also led to Kindle Fire HD, Kindle Fire, Paperwhite and Kindle held the top four slots on Amazon worldwide in the holiday season. Kindle stores have been opened in Brazil, Canada, China and Japan. According to Gartner, the Tablet segment sales are going to increase from 68 million units in 2011 to 118 million units in 2012 registering a 98% increase in volumes. 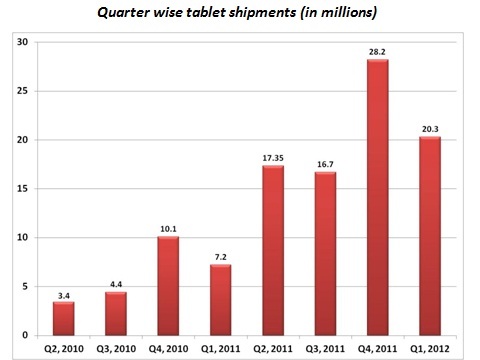 2011 saw tablet shipments multiply by 3.5X over 2010. Furthermore, the segment will see growth at 60%+ CAGR for the next 5 years and gartner expects that the total number of tablet users will be in excess of 660 million by 2016. Apple will be the key player and influencer in the segment, even while Amazon, Android and Windows build base and shall continue its leadership position well in 2015 albeit more smaller margins. Presenting my first infographic build to emphasize the promise in the Tablet devices segment. The 10% increase in market share of Android is due largely to the entry of the Kindle Fire by Amazon. Flurry, which compares application sessions among all Android tablets For January, uses month-to-date figures to provide hard testimony to the success of Amazon Kindle Fire. In November, Samsung Galaxy Tab dominated application session usage on Android, with the Kindle Fire only having recently launched. At that time, the Samsung Galaxy Time was widely considered the only viable competition to the iPad, though a distant second. The holidays provided a strong adoption of Kindle Fire, combined with significant downloads driven from the Amazon App Store, which has resulted in a massive surge in session usage that edges out the Galaxy Tab. 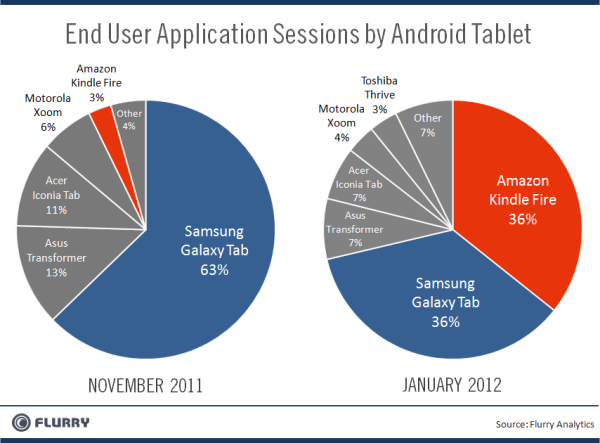 Kindle Fire represents 35.7% of sessions and Galaxy Tab represents 35.6%. 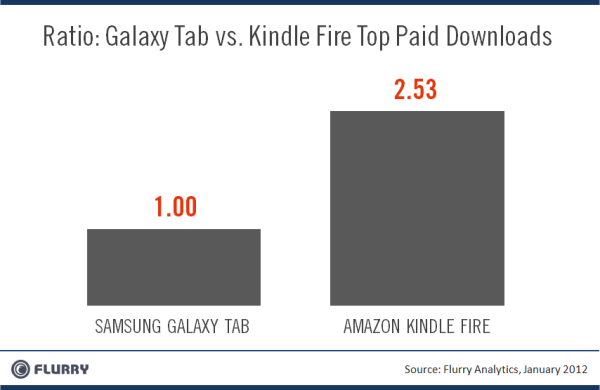 Remarkably, the Kindle Fire overtook the Galaxy Tab in just half a quarter. Total Android tablet sessions in January more than tripled over November, with Galaxy Tab sessions increasing by more than 50%. Overall, Android Tablets are growing aggressively as a category. So how can a late entrant like Amazon, with little-to-no hardware DNA, waltz in and knock off a consumer electronics juggernaut like Samsung, a company that also enjoyed strong growth in 2011? Amazon’s launch of Kindle Fire had more in common with an Apple-style launch than it did with aligning with the Android system.To date, the Android world has focused on marketing the operating system and the “power” of the devices, with quality of content and the consumer experience subordinated in priority. With Google managing the Android Market, which lacks content control and a seamless commerce experience, inertia pushes those developers who choose to build for the platform toward advertising models.Developers who monetize through other means tend to make less on the platform. 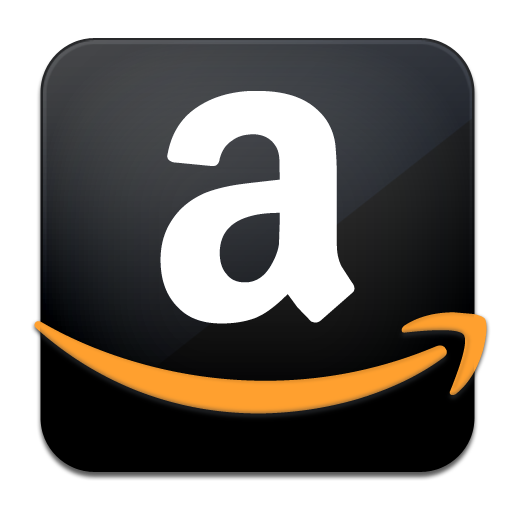 To ensure that it could take full advantage of its unique digital store prowess, Amazon forked the Android operating system. Apple, on the other hand, understands that great content is the key to increasing the attractiveness of hardware. They learned this hard way during the 1980s when an inferior combination of PC hardware and operating systems overtook Apple computers, primarily due to a lack of software.For the iPhone and iPad, Apple created a robust economy in which developers could thrive, ensuring their allegiance to innovating for the Apple platform, ultimately making Apple hardware more desirable, and creating a rare, but powerful virtuous cycle. Amazon’s approach to the distribution of digital content is the ultimate razor-razorblade model, where the “stalk” (tablets) is given away for as little as possible and profits are made from the sale of razors (content). Understanding that Amazon is a high volume seller of goods, now becoming ever more digital than physical, sheds light on why they embrace the end-user experience and the religious focus on making the sale of content compelling and easy. 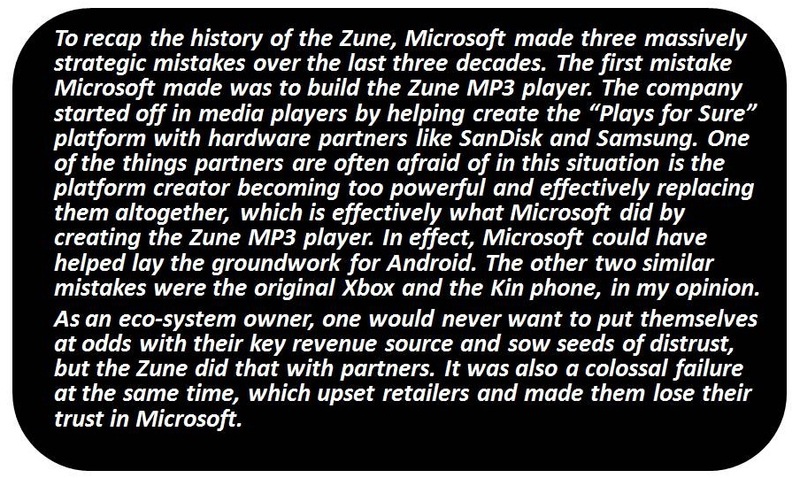 Thus the launching with an aggressive low price penetration strategy for their hardware, priced at $199, was critical to its strategy. Amazon, once moved the world from buying goods at retail to buying them online and having them shipped to doorsteps, is now distributing the new form of mobile store via tablets. In a move that reduces the possibility of its own disintermediation, Amazon’s distribution model starts with its own roots: books, music and video (aka “BMV”). Through this move, Kindle Fire is changing the rules of engagement on the Android platform to shape the playing field into one where they, the consumer and the developer win. Just two weeks after its introduction, Amazon’s Kindle Fire already is shaking up the market, with the device expected to surpass all other iPad rivals to take second place in the global media tablet business in the fourth quarter.Coming up from zero in the third quarter, Amazon will ship 3.9 million Kindle Fire tablets during the last three months of 2011, according to a preliminary projection from the IHS iSuppli Display Materials & Systems Service from information and analysis provider IHS (NYSE: IHS). This will give the company a 13.8 percent share of global media tablet shipments in the fourth quarter, exceeding the 4.8 percent held by No. 3 Samsung, and second only to Apple’s commanding 65.6 percent portion of the market, as presented in the table below. The Kindle Fire’s rapid ascent will help fuel the expansion of the entire market, with the additional shipments contributing to a 7.7 percent increase in the IHS forecast of total media tablet shipments in 2011. Amazon, with the Kindle Fire, has found the right combination of savvy pricing, astute marketing, accessible content and an appropriate business model, positioning the Kindle Fire to appeal to a brand-new set of media tablet buyers. Imagine a Walmart Hyperstore with individual 24*7 supply pipeline to the homes of each of its consumers. Amazon is dong just that with the Kindle in the Digital Space. 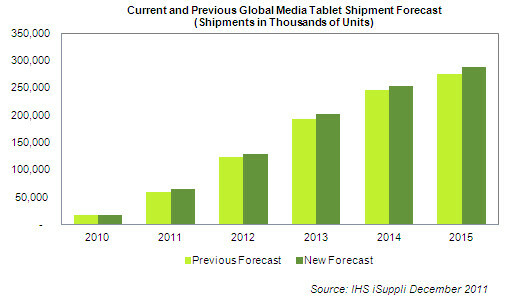 IHS now predicts global media tablet market shipments will amount to 64.7 million units in 2011, compared to the previous forecast issued in August of 60 million. The total shipment level represents 273 percent growth from 17.4 million units in 2010.The forecast for the following years also has been increased, with shipments expected to rise to 287.2 million in 2015, up from the previous forecast of 275.3 million. Sales of the Kindle Fire alone will account for much of the growth in sales. Dramatically reduced pricing in general in the non-Apple portion of the media tablet market also will play a role in expanding sales. Most other Android tablet makers must earn a profit based on hardware sales alone. In contrast, Amazon plans to use the Kindle Fire to drive sales of physical goods that comprise the majority of the company’s business. As long as this strategy is successful, the company can afford to take a loss on the hardware—while its Android competitors cannot. While Apple remains dominant in the media tablet market, speculation is rife that the company will respond to the Kindle Fire’s aggressive pricing with a lower-cost version of the iPad. A far more likely scenario is that Apple also may reduce the pricing on the iPad 2 when the company introduces the iPad 3. This will provide a value alternative for entry-level users in the same way that the company continued to offer the iPhone 3 when it rolled out the iPhone 4. This approach would allow Apple to maintain its target profit margins on both the iPad 3 and the iPad 2, while offering end-users an ever-expanding family of products.